Trends come and go in the food industry but there is one I hope is here to stay. The movement of Farm to Table has been popping up all around town. This not only supports local farmers and businesses, it also ensures that the food you are putting in your mouth is of the freshest quality. Marchand's Bar and Grill located inside Renaissance Vinoy Resort & Golf Club in downtown St. Petersburg has introduced a new Farm to Fork menu and they asked a few local bloggers to stop by and check it out. 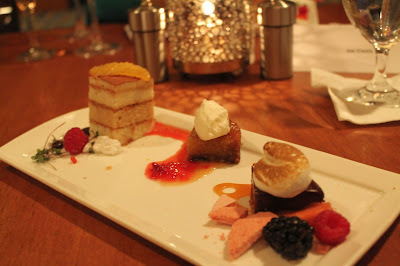 We experienced Chef Mark Heimann's Surprise tasting which was a 5 course meal decided by the Chef. This menu changes weekly so there will always be a surprise in store when you order it. Our 5 courses were paired with wines selected by level two sommelier Mark Jenkins. 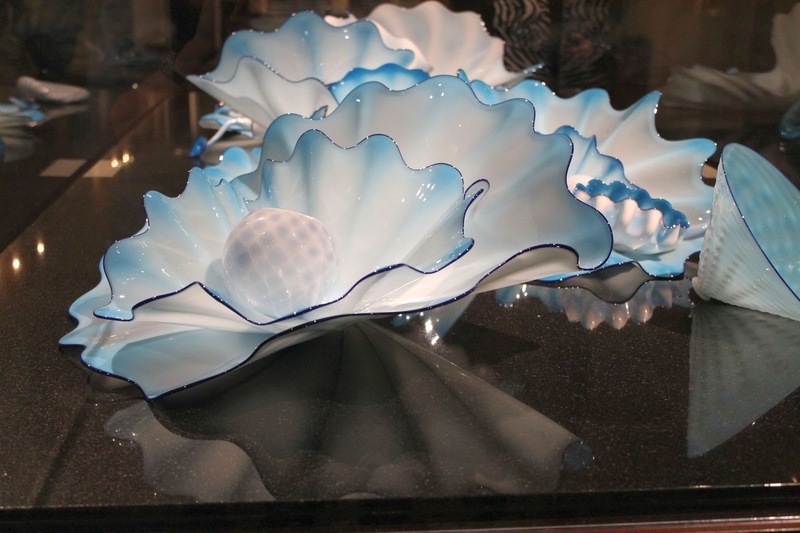 We walked into the stunning hotel and the first thing I noticed was beautiful display of Dale Chihuly glass sculptures and the metal sculpture room dividers. I then heard the sounds of live music playing in the halls and knew I was in a pretty spectacular place. We were greeted with a Florida Mojito, made with every kind of FL orange. I am a FL native and my Grandparents owned a 50 acre citrus grove.This drink was delicious and I could have taken down many of them, but I knew there was wine in my future. The fact that Marchand's uses local citrus to make their drinks hit a special place in my heart. 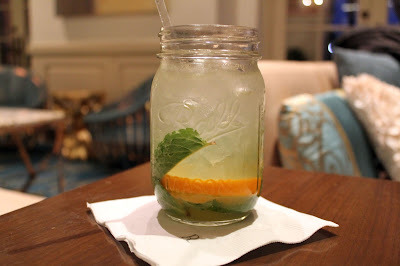 Not to mention it was served in a Ball Mason Jar! This was the first of many moments this dinner gave me memories of my Grandma. We learned that the Vinoy has a wide array of hand crafted cocktails and they have a monthly drink special which is decided by the season and current trends. I look forward to the Spring weather when we can enjoy these fabulous cocktails on the Vinoy's famous patio. We got a sneak peak of the ball room and learned a little history of Vinoy. 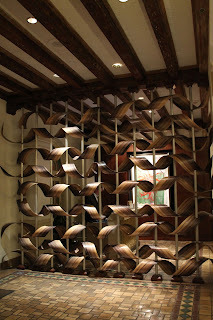 It is hard to believe this beautiful hotel sat vacant for many years. As someone who worked many years in resort development, I was very impressed with the renovation, which cost $93 million and the hotel is currently an almost replica of it's former self. All I could think while sitting in that ball room was, this is a possible location for an amazing wedding. 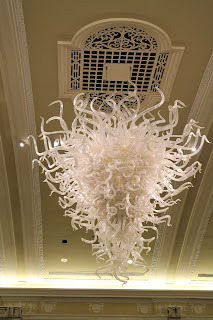 Especially when I saw a chandelier by Dale Chuhily. OK I know you are here for the food and not the decor. Seriously though, if you find yourself in St. Pete, go by Vinoy to grab a bite to eat and check out this amazing hotel. You will thank me later. 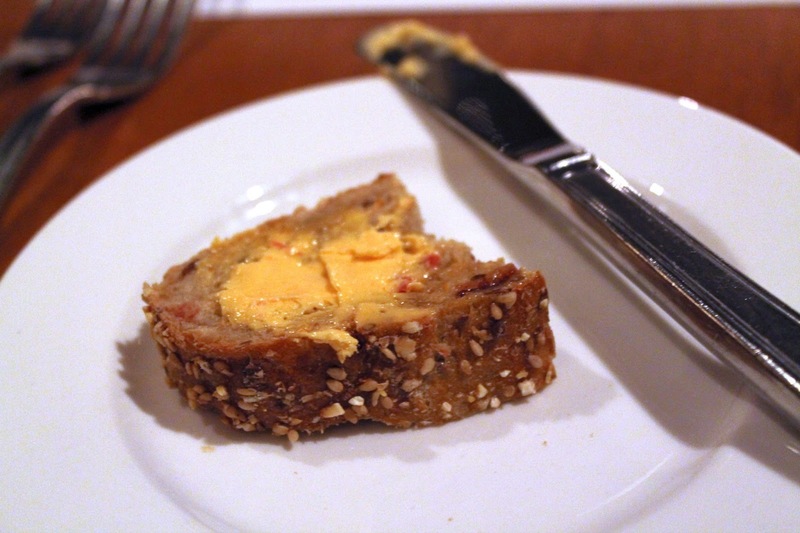 We walked into Marchand's Bar and Grill's dining room to find fresh baked bread waiting for us with homemade butter. We had two types of bread, one of which was a cheese bread and it was eye crossing good. We also had the below fruit grain bread. The butter on top of the grain bread was sun dried tomato and worth every single calorie carb ingested. Our first course of the night was a Mangalitsa "Croque Madame". Many of us at the table made the comment that we could inhale 5 courses of this small plate. It was insanely delicious I love a good Madame and this one truly hit the spot. One thing that caught my interest was that Chef used Georgia Red cheese, something I have never had. 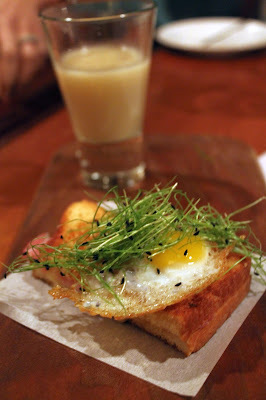 It was topped with a fried quail egg and served on toasted brioche. A Silk Onion Soup Shooter using Florida Sweet onions accompanied the petite sandwich. This course was served with a glass of delicious Acrobat Pinot Noir. 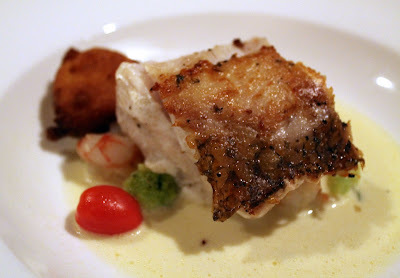 Course number two was a beautifully presented Golden Tile Fish with Romanesco cauliflower, Sun choke hush puppies and Rock Shrimp Nage. Tile Fish is one of my favorite white fishes, it is very mild with the perfect flake. The crispy skin set this one apart. That hushpuppy was to die for and the rare Romanesco cauliflower added a splurge of color to the plate. Love! This course was served with a delicious glass of Hahn SLH Estate – Chardonnay. This was a low oak chard and it was one of my favorite wines of the night. I eyeballed Gabe's glass for 10 minutes before he handed it over. Course three was my favorite dish of the night. 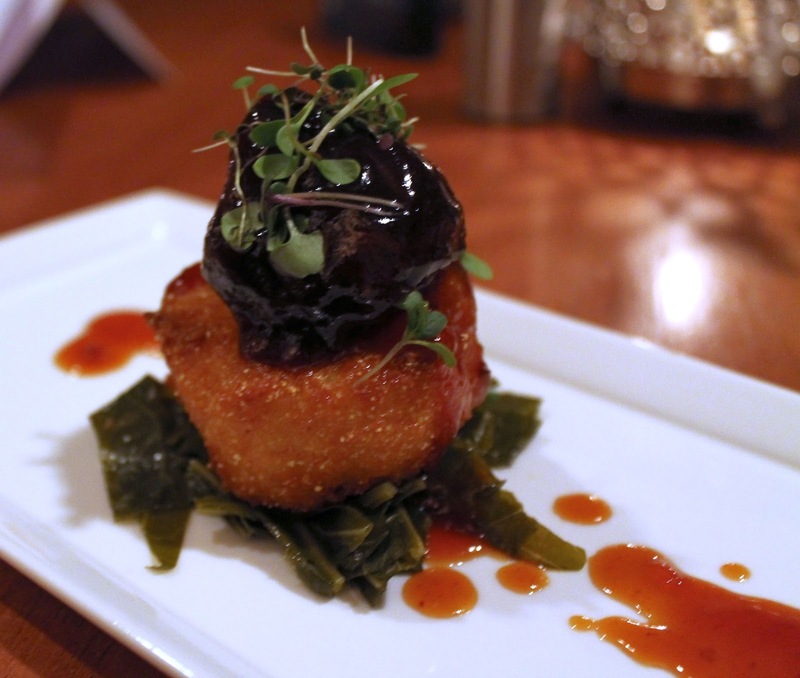 Pork Cheek in a Murcott Tangerine BBQ sauce, fried mac and cheese and smoked bacon collard greens. First - you know the Grandparents I mentioned above? They are from South Carolina. So this dish right here is dangerous to present to a Southern girl. I am a snarky judge when it comes to mac & cheese and collard greens. I can say that Chef Mark nailed this dish. I even asked him how he cooked his collards, to find out it is very similar to how my Mom and Grandma make theirs. I cannot leave the Pork Cheek out - amazing - and the sauce, insanely good. This southern girl was very impressed with this dish. The Pork Cheek was served with a glass of Trivento Amado Sur – Malbec Blend. Course four was a Key West Yellow Tail Snapper served over a chorizo black bean cake and warm yellow tomato vinaigrette. This was around the time my taste buds were a little confused. The courses complimented each other very well but I was still on my collard greens and fried mac & cheese high. This dish was great, but it didn't stand up to the previous one. 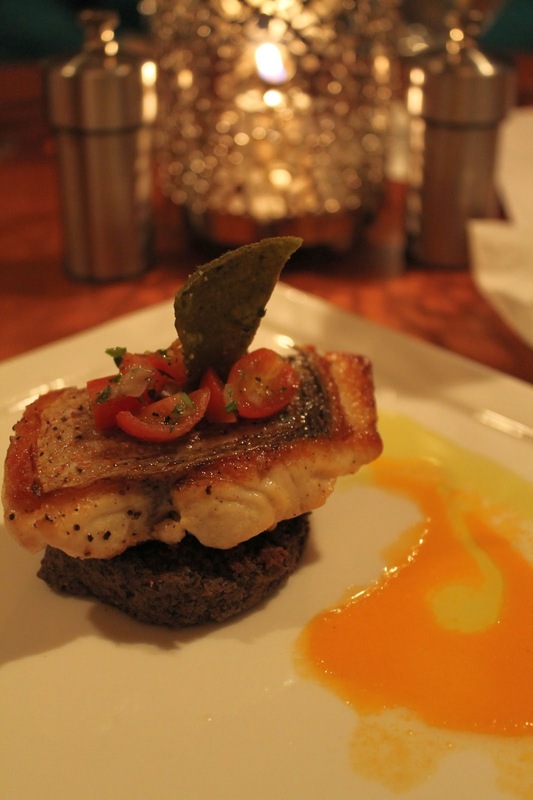 During dinner, one of the "plus ones" stated that there had to be some sort of meat in the black bean cake. After seeing the menu, I realized the guys were right. The smokiness we tasted was chorizo! The Yellow Tail was served with a glass of Trivento Amado Sur – Torrontes. Now are you ready for this? Course five....Braised Rabbit served over Savoy Cabbage, Speck, Yukon Potato Puree and a Pinot Noir Reduction. This was my second time in two weeks having rabbit, the first in NOLA. It reminds me a great deal of duck and I heard multiple "this taste like chicken" from the table. It was a very good dish! 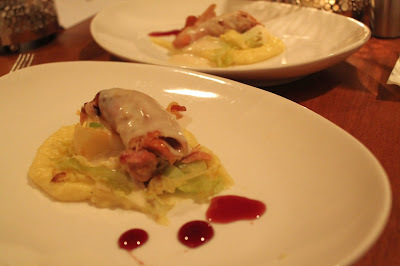 The Rabbit was paired with Four Vines – Old Vine Cuvee Zinfandel. This was a very peppery Zin and I loved every moment of it. Just when I thought this meal couldn't be beat, we were brought out a dessert trio of Tiramisu, Caramel Oatmeal Pie, Smores Hazelnut Ganache Torte. The Smore's was off the chain fabulous. I could have had 10 of them! I tasted the other two, which were delicious, were absolutely in the Smore's shadow. This final dish was paired with a glass of bubbly, Santa Margarita – Brut Rose. I was a giddy girl when I heard that Santa Margarita makes Brut Rose and am on a mission to find it in the store. We learned that Chef Mark creates his menu using whatever local product he has in the restaurant. The imagination and thinking outside of the box was shown here. Any Chef who makes collard greens that taste's just like my Grandma's while knocking a Croque Madame out of the park is a Chef I would come back and visit again and again. My hat goes off to you Marchand's Bar and Grill. You made a believer in me and you will be seeing us soon. Here are some of the local farms that Marchand's Bar and Grill uses in their amazing menu: Mitchell's Natural Produce, Glory Road Farms, Pure Florida Apiary, Worden Farm, Geraldson Farms, Seeley's Ark, Pasture Prime Family Farm, Hunsader Farm, 3 Boy Farm, Jones Potato Farm, Watercress Farm, Eco Farms. Thank you Marchand's Bar and Grill for supporting local businesses. Oh so delish! I am still thinking about that croque madame a week later. Such an awesome evening!